1) My garden area is in the backyard. It didn't get resodded (obviously). And the weed problem is very apparent around the edge of my bed(s). Basically, I spray pre-e pretty close to the bed, but leave a strip of buffer. This has been overtaken by weeds, so I have this unsightly one foot or so wide ring of weeds. Any recommendations other than hand pulling? This is the smaller of the two problems (Hand pulling isn't terrible, and I can always just keep them mowed). 2) W/in the garden area itself I am constantly battling weeds. I bring in good compost every year, I try to stay on top of the weeds (e.g. right now I'm out there multiple times a week w/a stirrup hoe trying to get them gone before I even see them). But inevitably, as soon as I travel for a week during the summer, or we hit a rainy period where we can't get out there and work, the weeds start to swallow up everything. How do you battle this in your garden? I obviously don't want to spray Celsius or round-up (or whatever) in the garden. Flame weeder? What's the answer here? Looking forward to seeing what other folks are doing. Not sure how big your garden it, but I killed the grass, covered it with 4 inches of mulch and then did a concrete border. This has reduced my weeds by 99%. Wood chips from a tree service are usually free and easy to come by. Several inches and this will help and they break down naturally. You could also put newspaper or cardboard down first and then cover with wood chips or mulch . These will also break down naturally. It's probably the compost. Some parts of my garden have very minimal weeds, some it's like a groundcover, and I can tell it's the compost because I have been expanding my garden in stages so different areas that got different batches of compost have hugely different amounts and types of weeds. Sometimes you just get a bad batch. But I would definitely recommend mulch. Even a thin 1 inch layer will help tremendously. Supposed it could be the compost. I suspect I need to do something similar to @Aawickham78 to really defeat the issue. Since I leave some space around the garden area w/o spraying pre-emergent, I think a lot of my weed pressure in the beds ends up coming from that surrounding skirt. 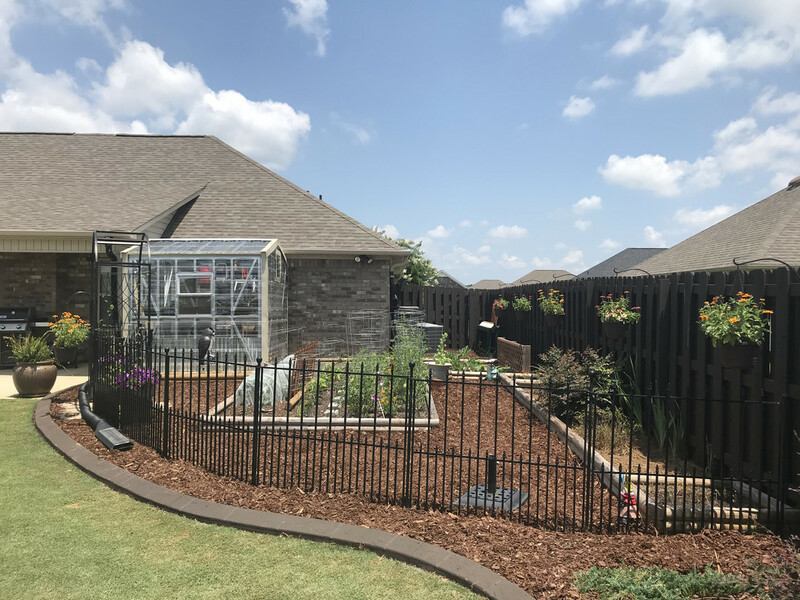 Probably need to get heavy mulch down over my entire garden area and then delineate that from the yard somehow (right now they kind of run together). Probably would go some route other than a concrete border just b/c I"m constantly tinkering w/size and shape of the garden, but that is probably the right direction. That'll also be a loooot of mulch (I'd guess somewhere around 10 cu yards). So my original post was about my vegetable garden. Here's another example, though. Over the last couple of years, I've created a garden bed along my back fence. It's some mix of "perennial food bed" and flower/landscaped bed. It has a variety of plants. 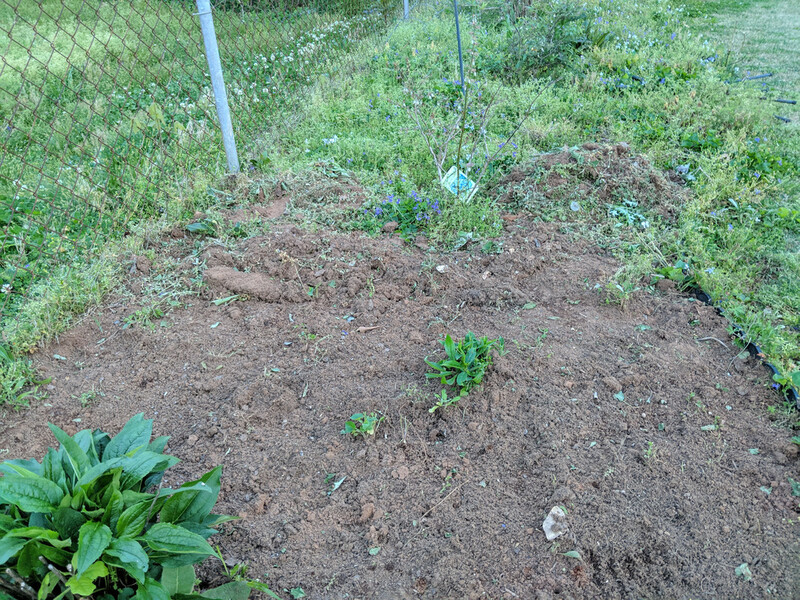 Blueberries, sorrel, strawberries, cut flower area, fig, plum tree, various bulbs, etc. I have been so focused on getting the yard ready that I have neglected this bed and the weeds are completely out of control. I got to work on it yesterday and worked on the cut flower area. Got it relatively weed free, but they will of course come back if I don't do anything. I think I'm just going to go with @Aawickham78 and lay down a thick layer of mulch (after removing the weeds). Will probably take a ton, but at this point, gotta do something. Any advice? You need to install some type of edging all around garden. Next to the neighbors fence, I would get steel edging and hammer it in or purchase fenceguard. This will help hold the mulch in as well as keep his weeds out. I used metal at my last house and it worked great ! Hadn't seen the fence guard that you linked to. I think I might have to order some today. I know you went with the concrete edge on yours. If you don't mind me asking, about how much did that cost per linear foot? Not sure how economical it would be as my total perimeter for that bed is about 85'. If you weren't going to go w/a concrete edge, second choices (I also suppose this has transformed from gardening to landscaping, so if mods think it should be moved over there, go ahead). Its $7.00 a foot installed ,stained, stamped and sealed. I had a total of 412 feet installed front and back. That's actually not as bad as I thought it would be. Guess I didn't really have a reference to work off of. Who did you get to do it? Someone out of Athens?